The Miracle Hunter : Marian Apparitions::Zaragoza 40 A.D. According to legend, in the early days of the Church on January 2, 40 AD, the Apostle James the Greater was proclaiming the Gospel in Caesaraugusta (present day Zaragoza) by the river Ebro, when he saw Mary miraculously appearing in the flesh on a pillar calling him to return to Jerusalem. The pillar, which was being carried by angels, is believed to be the same one venerated in Zaragoza, Spain today. Miraculous healings have been reported at the location. St. James the Greater is born the son of Zebedee and Salome and brother of John the Evangelist. James and John were with their father by the seashore when Jesus called them to begin traveling (Mt.4:21-22, Mk.1:19-20). According to Mark, James and John were called Boanerges, or the "Sons of Thunder" (3:17). Death of Christ . After the crucifixion, resurrection and ascension of Jesus, his Apostles began to spread the message he left throughout Israel and shortly thereafter, through the Roman empire. St. James the Greater travels as far west as Spain to the village of Zaragoza (Saragossa) in north east Spain to preach the Gospel but has little success. The place was originally the ancient sacred site of Salduba. Conquered by the Romans, it was renamed Caesaraugusta after the Roman Emperor. The name became corrupted by the Arabs to Saraqustah, and eventually evolved into Zaragoza. St. James the Greater was preaching on the banks of the Ebro River in Caesaraugusta (present day Zaragoza, Spain). When it looked as if James' mission was destined to be a failure, and he was subsequently depressed, he was deep in prayer when he witnessed an apparition of the Blessed Virgin Mary atop a pagan standing stone. He was visited by the Virgin Mary in the flesh (she is still alive at this point in history) who appeared standing on a six-foot tall pillar of jasper carried by angels. She gave him the pillar and a statue of her with the infant Jesus saying: "This place is to be my house, and this image and column shall be the title and altar of the temple that you shall build... and the people of this land will honor greatly my Son Jesus"
James then builds a chapel, the first built in honor of Mary. It was to become the first church in the world that was dedicated to the Blessed Virgin Mary. The jasper column and the wooden statue can still be seen on special occasions at the church. Before long, the chapel became a center for the conversion of pagans. Because of the apparition and the rapid rise of Christianity, Zaragoza quickly became a major political and commercial center. The simple chapel was often updated, growing in size into the existing Cathedral that was completed about the 17th century. St James suffered martyrdom (Acts 12:1-2) being beheaded by King Herod Agrippa I (becoming the first apostle to be martyred for his faith) and, according to the tradition of the early Church, he had not yet left Jerusalem at this time (see Clement of Alexandria, Stromateis, VI; Apollonius, quoted by Eusebius, Hist. Eccl. VI.xviii). Several of his disciples took his body and returned it for final burial in Spain. The local queen, observing several of the miracles performed by James' disciples, converted to Christianity and permitted James' body to be buried in a local field. Eight centuries later, a cathedral in honor of St. James was erected after his gravesite was rediscovered by a local hermit. The hermit found the burial site after noticing an unusual star formation. The site for the cathedral was called Compostella (starry field), in Galicia, Spain, and it is a major pilgrimage site to this day. After the Reconquest of Zaragoza, a Romanesque style church was ordered to be built. This church was damaged by fire, and reconstruction began in the Mudejar-Gothic style. In the Philippines, in the south, is the city of Zamboanga, Fort Pilar was founded by the Spanish Jesuit priest, Friar Melchor de Vera, as a defense against pirates and slave traders. One of the oldest and most Hispanic cities, it came to be known as the City of the Flowers. Its patron saint was Our Lady of the Pillar or Nuestra Senora del Pilar. As a result, you will often encounter the female given name, Pilar. The baroque-styled Basilica-Cathedral of Our Lady of the Pillar was built starting in 1681 and officially finished in 1872. The Pilar Basilica is one of two minor basilicas in the city of Zaragoza, and is co-cathedral of the city alongside the nearby La Seo Cathedral. The Cabildo of Zaragoza decided to change the layout of the Chapel and commissioned architect Ventura Rodríguez, who transformed the building into its present dimensions of 130 meters long by 67 wide, with its eleven cupolas and four towers. St. James the Greater was preaching on the banks of the Ebro River in Caesaraugusta (present day Zaragoza, Spain). When it looked as if James' mission was destined to be a failure, and he was subsequently depressed, he was deep in prayer when he witnessed an apparition of the Blessed Virgin Mary atop a pagan standing stone. He was visited by the Virgin Mary in the flesh (she is still alive at this point in history) who appeared standing on a six-foot tall pillar of jasper carried by angels. The Virgin Mary tells St. James the Greater: "This place is to be my house, and this image and column shall be the title and altar of the temple that you shall build... and the people of this land will honor greatly my Son Jesus"
The chapel originally built by Saint James was later destroyed as were several subsequent chapels on the same site. The statue and pillar have been preserved however for almost 2000 years. Numerous healings throughout the ages have been attributed to the Virgin by those visiting the site seeking her help. One day a young man named Miguel Juan Pellicer di Calandra had a fairly serious accident. His knee needed to be amputated. He prayed before surgery, and again afterwards, thanking God for still being alive. But he could no longer work and he became a beggar ... Each day when he returned to his home, he would put oil from the lamps in the sanctuary on his scar. Two years and five months after the amputation, after praying to Our Lady of the Pillar as usual, he fell asleep and the next morning he awoke with two legs! An investigation was conducted and the news of the miracle spread. Our Lady of the Pillar is the patron virgin of Spain and its Civil Guard. In Zamboanga City, Philippines, the Virgin of the Pillar has been venerated for almost five centuries. Her statue is embossed at the top of the facade of the 16th century Spanish military fort called El Fuerza Real de Nuestra Señora Virgen del Pilar de Zaragoza. The military fort is now a Catholic Marian Shrine. 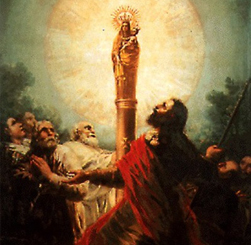 The feast of Our Lady of the Pillar is on October 12. Every Latin-American nation has donated national vestments for the fifteenth century wooden statue of the Virgin, which is housed in the chapel on the pillar of jasper and is carried at the head of a procession around the city on the feast day. The shrine has become a place of pilgrimage for both Christian and non-Christian. The apparitions of Our Lady of the Pillar have not been formally approved but are accepted by tradition and are implicitly approved by the elevation of the church to basilica status.